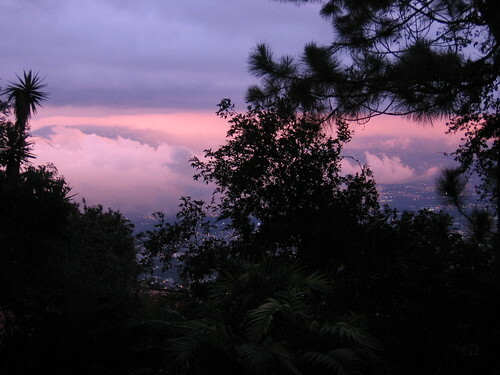 My mother just sent me a photo of the sunset view from their little house in Costa Rica. They were able to buy a small piece of mountain property about twenty years ago, then they sold half of it and made their money back. They built a house on it a few years ago for a total of $34,000. It was all done by local workmen who emailed photos and questions to my parents, who emailed instructions back. What a wonder of modern technology, huh? So now, they have a place to escape every once in a while. I am the only one of us six kids who has never been, since I have always had the small problem of airfare for five to contend with. 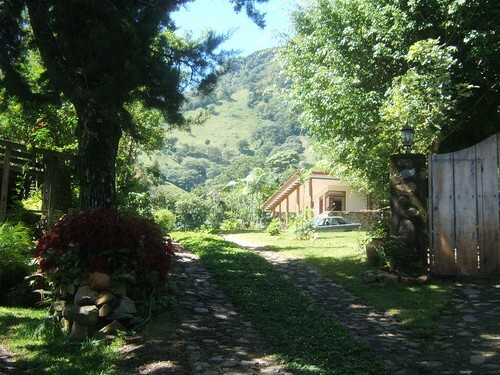 But when I see this photo, I really want to be there, breathing in the humid air and smelling all the green around me. Here is a shot of the entrance to the house during the daytime. ~ by bekaboo on March 7, 2009.
wow thats an amazing view, count me in for a trip away. It looks nice, but the cost for passports and airfare would be out of my reach, too. Just taking the littles to CA is hard (not to mention the grousing from The Husband about the bigger kids not getting to go)! I think you should only have to deal with airfare for one. Nick can come too if you wanted. Wow, looks so beautiful and RELAXING! Seriously, you should take that trip with just the hubby and get away for awhile! Ahhh…..
this looks like such a peaceful place! i love your blog… i too am a secondhand sue!